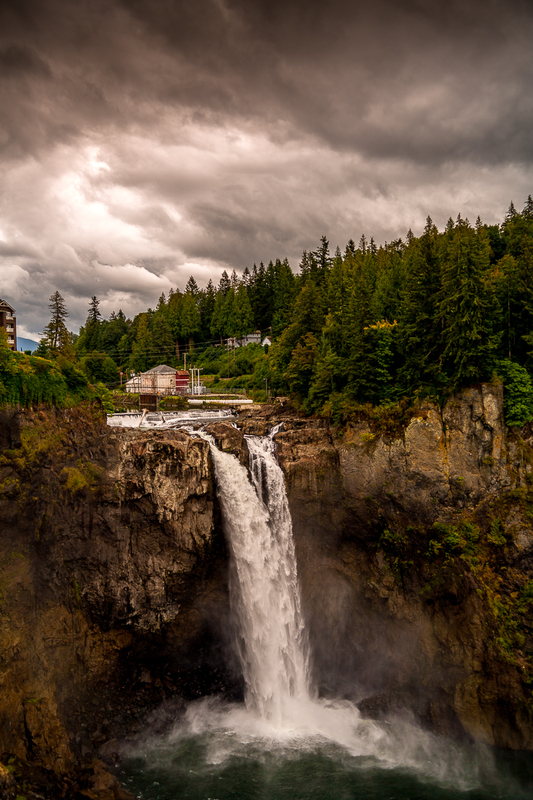 Snoqualmie Falls is 25 miles from Seattle, Washington. It is one of the major source of naturally generated hydro-electric power in the West Coast of United States. Simply beautiful click . great work. a thumbs up and a resteem from my side and a very best of luck for #colorchallenge. Pretty cool, my wife and I were just there a couple of weeks ago when we went to Seattle. Super awesome to see! I can't believe how wet we got just from the water coming up from the falls. That view is at the beginning of Twin Peaks. Nice! Great photo! There are 3 things I like about it! I like the scene in the photo, its amazing! I like the water fall ,its interesting! I like the clouds ,so heavy and likely to rain. @steemfuzzy , i give you my thumb up! hey Ive been there, and swam at the bottom of those falls too. nice place. :) Did you go to the casino next to the falls? lol....lots of weddings there. There's such a strong story being told here. The water has so much movement, not to mention the abandoned buildings on the cliff. The wall's painted with beautiful white to bring out texture. Great work mate. Have you ever been to the Tahquamenon State park and viewed the Tahquamenon Falls in the upper peninsula of Michigan or the Pictured Rocks National Lakeshore, we went there when I was a teenager and it's just absolutely beautiful. What an UNBELIEVABLE photo. It's like a painting come to life. I love the Seattle area--next time I'll have to check that waterfall out. Doesn't even look real. Very cool ! I feel this is like paint. Stunning photo. I love water especially being a pisces. Let's hope Nestle doesn't try to acquire this considering they are monopolising much of the Earth's fresh water supplies. Peace. Seattle is a beautiful place. Thanks for sharing the photo. My Dad often talked about Snoqualmie Falls. This is an absolutely gorgeous share. Thank you.